There are many amazing races and running events around the world and each and every one of those events leaves us with special memories. But there are some that hold particular meaning and significance to us. For me, one of those races is the Röntgenlauf Race Weekend in Remscheid, Germany. The run follows the scenic Röntgen Trail around the circumference of Remscheid and passes through woods, quaint villages and farmers’ fields. It also runs through the historic cobble-stoned town centre of Lennep with its city wall. Lennep’s most famous native son is – you guessed it – a certain Mr. Wilhelm Conrad Röntgen, the man who discovered the x-ray and earned a Nobel prize for his trouble. What’s so special about this event, you may wonder? First of all, the x-ray has given countless athletes information about how soon they may be able to get back to running, so this connection alone should make the Röntgenlauf a special event in every runners mind! And then there is the cool finisher shirt featuring a running skeleton. But that’s not all. Remscheid is the town where I was born and raised. My entire family still lives there, as do two close friends from high school. I go back regularly to visit and when the timing works out, I register for the local race weekend in October. Like many race weekends, the Röntgenlauf offers a variety of distances from the 2.5 km youth run to the 63 km ultra marathon, so no matter what shape I am in, there is an event in which I can participate. What’s more, it is the only event where my family can come out to watch and support, which is another reason why it is special to me. And it is an event, at which I can line up at the start with my uncle, who has been a great influence in my life and who got me involved in running when I was a teenager. My uncle didn’t always run races. He started running for weight loss and fitness and was never the competitive sort. He simply got out three times a week and didn’t worry too much about times and pace. But after years of seeing me run marathons and watching his older brother, who is not even a runner, finish the Berlin Marathon, he decided it was time to tackle the big 42.2. Ever since then my uncle has lined up at the start of either the half or the full marathon of the Röntgenlauf weekend. One of his biggest fans and supporters was my grandpa. He had a corner of the course picked out where he would stand, rain or shine, to cheer us on. Seeing him there, looking proud, always put an extra spring in my step. In 2009, I was signed up for the Marine Corps Marathon in Washington, D.C., a race that had long been on my to-do list. But it was not meant to be. A week before the race, my sister called to let me know that my grandfather had died. The next day I was on a plane to Germany. His funeral took place a few days before the Röntgenlauf race weekend. My uncle and I discussed what we should do. He was registered for the half marathon, but wasn’t sure if he would still run. In the end, we decided to participate in the race together, running side by side the whole way, in memory of his dad and my grandpa. Our chatter fell silent when we passed grandpa’s spectator spot and then for the rest of the way, we shared many a story about this amazing man who was so pivotal in both our lives. Following the run, I learned that race organizers were planning something special for the 10th edition of the race in 2010. A 100 km ultra was going to be part of the agenda! 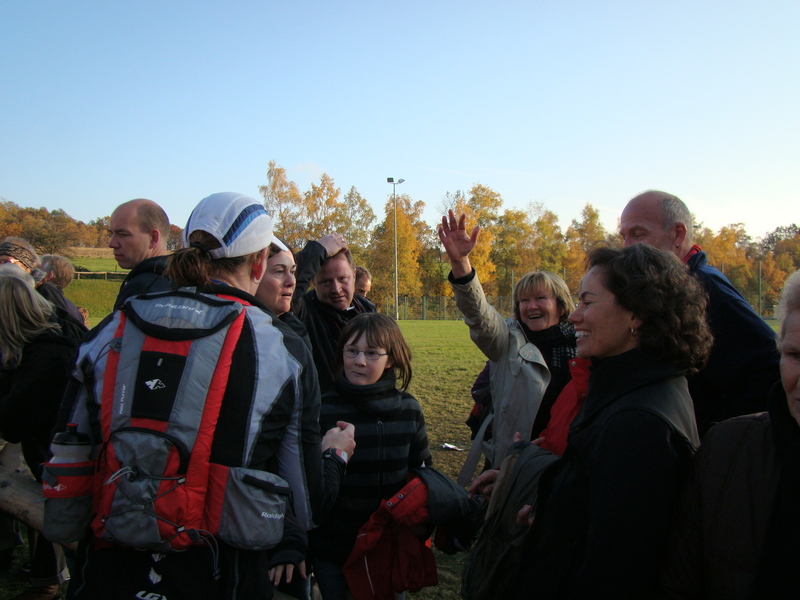 I made the decision right then and there – I would be back in 2010 to run the 100 km for my grandpa, to see my uncle complete his 10th consecutive Röntgenlauf and to keep my grandma company on the first anniversary of my granddad’s death. The race would be capped at 100 runners, so I checked the web site almost daily to make sure I wouldn’t miss the start of registration and miss out on getting a spot. Not only did I get in, but I would also be joined by my friend Tineke from Nova Scotia, who would fly to Remscheid to run the half marathon. My day in the 100 km field started at 5:30 a.m. while my uncle Hans-Peter and Tineke could sleep in and start their race at 9:30. By the time the start gun went off for them, I had already run a marathon in the darkness and the rain. A volunteer on a mountain bike kept me company on the trails during the early hours. When I came through the start/finish area after running about 45 km, my high school friend Jasna was there with her whole family to give me a dry shirt and warmer jacket, as well as a hot cup of tea and a whole lot of cheers and hugs. With that the rain also stopped and I started catching up with the marathon and half marathon fields. I worked my way up the field and then, on the crowded, single-track Highway to Hell – a hill we climb to AC/DC’s famous tune – I saw Tineke up ahead and told her to look out for the Champagne aid station at the top of the hill. The support from the spectators and from the other runners was phenomenal, especially once they saw by my special race number that I was one of the 100 km runners. I can’t tell you how many guys literally tipped their running hats to me to show their respect for going the distance. Little did they know that it was simply because I had inherited my grandpa’s determination! At the finish line, I was welcomed by the smiling faces of friends and family, including Hans-Peter and Tineke, who had a great race in the half marathon. I thought about my grandpa and I knew he would be proud. This entry was posted in Ultra running and tagged 100 km run, amazing races, family, Lennep, nobel prize, race weekends, Röntgenlauf, Röntgenweg, Remscheid, remscheid germany, special memories, Ultra marathons, Wilhelm Conrad Röntgen, X-ray. Bookmark the permalink. LOL, I did indeed forget the harassing text messages I got during the run telling me to hurry up, so you guys could finally go to the beer tent instead of standing at the finish line! 😉 Some day we`ll go back with a whole crew of Canadians! Wow what an amazing story. Thanks for reminding us how running really is a family and global affair where we can support each other in so many ways! Thanks, Megan! In addition to my real family, running has given me a whole other global family that I met through races around the world and with whom I keep in touch regularly. I really love that aspect of the sport and the support people give each other!